Have you ever walked into a kitchen and thought “That’s it, I’m never leaving again!”? If so, chances are, this kitchen has been one styled in a Bohemian design. 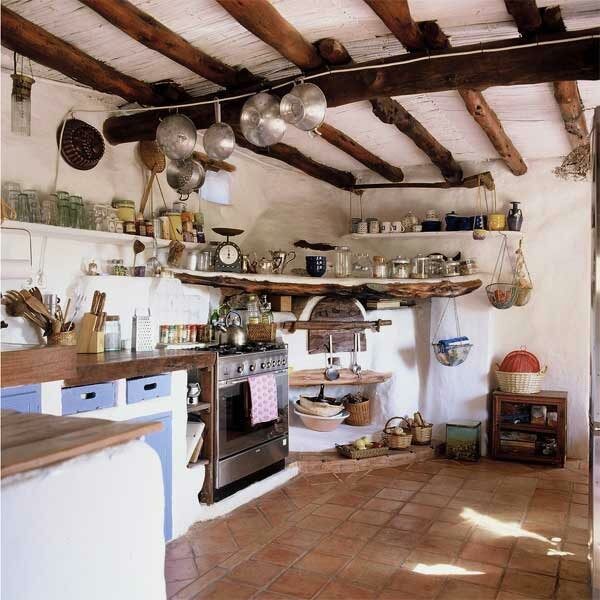 What then is a Bohemian kitchen design? Well. The answer to this question is as complicated as it is straightforward. Bohemian, or Boho, is not a style per se. And neither is it a type of interior design. Boho is, strictly speaking, a way of life – typically, an artistic and open way of life. But that, too, isn’t completely true, either. 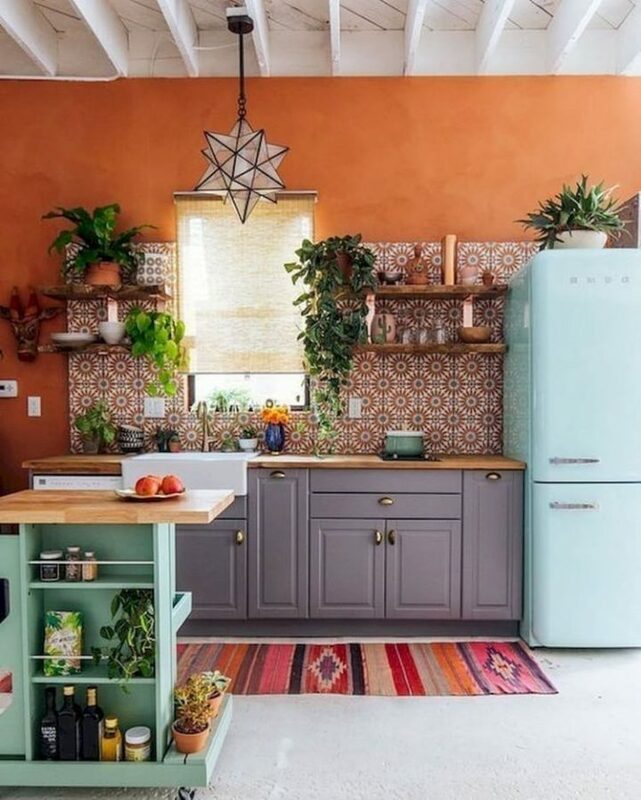 You don’t need to be artistic, cosmopolitan or creative to rock a Bohemian kitchen design, but it doesn’t hurt to be, either. it’s homely: As we have hinted at in our opening, the Bohemian style is well-known for creating an atmosphere in which you can’t resist staying. It looks comfortable, cosy, lived-in, and just like home. it’s vibrant: Bold colours, bold patterns, and a statement piece of furniture or art or five thrown in make up the basis for a true Bohemian style. Maybe these thing’s shouldn’t go together, but somehow they do. it’s mix and match: Each and everyone of us has those things they have collected somewhere during their life – that great scarf you couldn’t resist buying on your beach holiday, that funky bar-stool you got for a bargain at a garage sale, that old radio you saved from your parent’s attic, or that sheepskin rug you simply had to take home but never actually used. 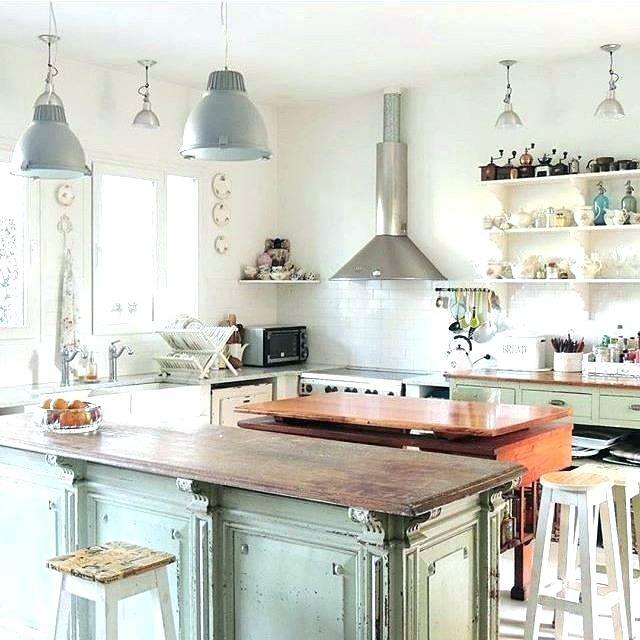 Those, and much more, are the basis of your Bohemian kitchen design. It’s the mementos and big finds that represent your life that make up the heart of this style. That’s the basis – all else is completely up to you. Embrace your creative side, dare to be bold, and just go all out when it comes to creating a unique, vibrant, and -in the best sense of the word- whimsical look that represents your personality and all you have loved, seen, enjoyed, and experienced in your life so far! Not ready to fully unleash your inner cosmopolitan artist yet? No worries! 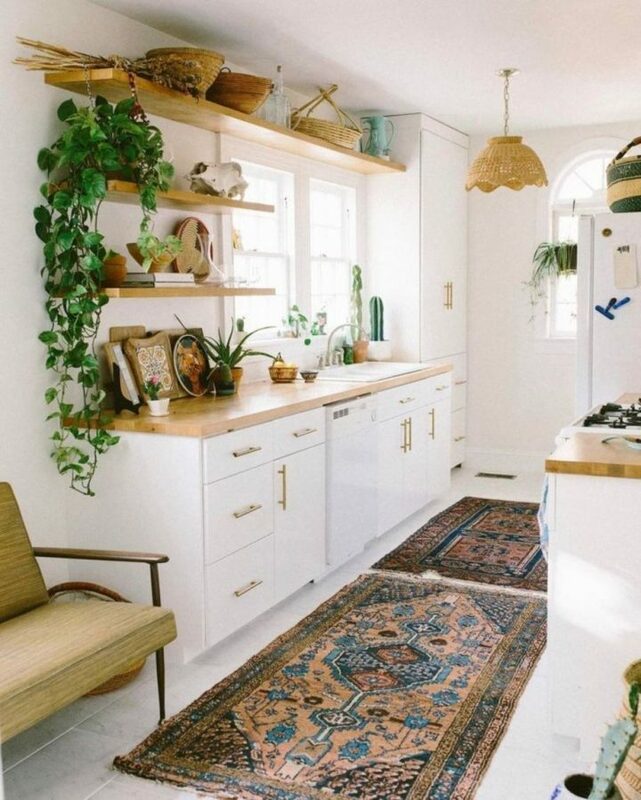 We have collected some of the most beautiful Bohemian kitchen design ideas for you. Let yourself be inspired! 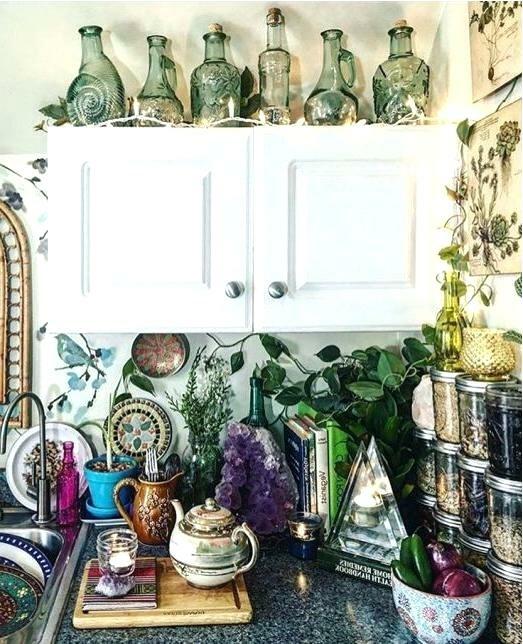 This Bohemian kitchen is the perfect example for the first decoration rule: colours and patterns that should not conceivably go together melded into one perfect whole. 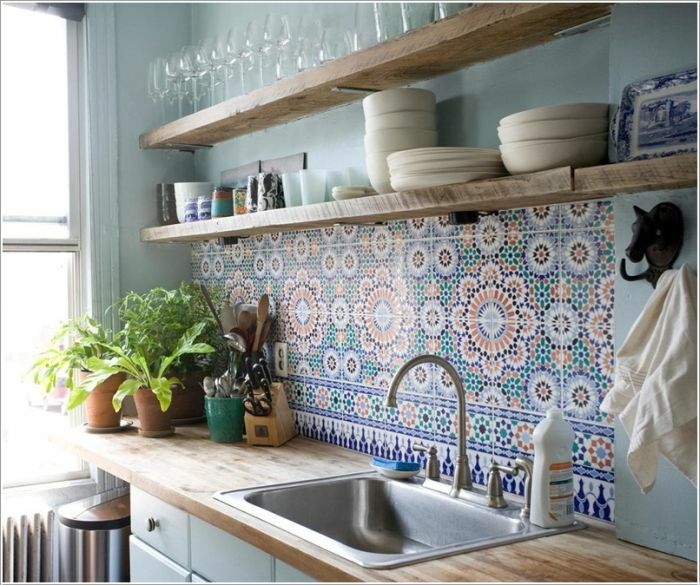 All you need for this decoration idea is a set of paint cans, bold rugs and tiles, and the will to try something daring! But you do not need to go all out with colours to create the coveted Boho style. 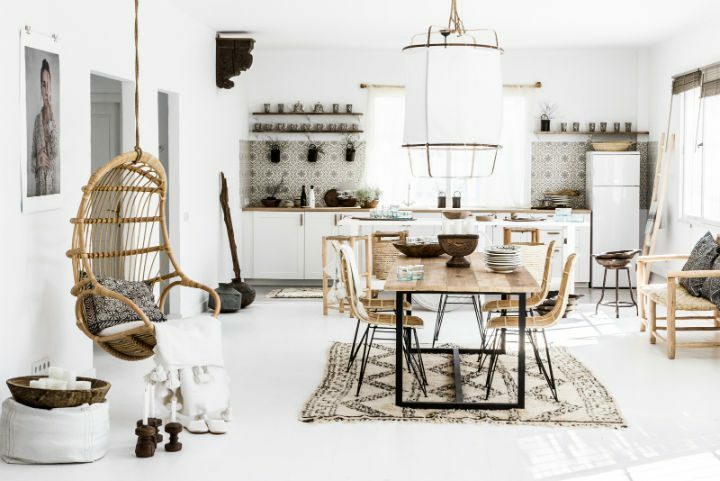 Quite on the contrary, even a sleek, modern white and gold kitchen can be the perfect base for a Bohemian style decoration. In this case, it’s the two prominent patterned oriental rugs on the floor that build the base of the look. In addition to that, a wealth of cosmopolitan knick knack and plants lining the shelves pitch in to create the feeling of homeliness. Sometimes it’s not the bold statements that create the look, but rather the details. The clever use of mosaic tiles set onto the wall behind the counter subtly creates a homely, oriental atmosphere that builds the basis for the relaxed, cosy design created by a wealth of plants and an open shelving displaying the no-frills china and glassware. You really don’t need to go boldly colourful to create a truly cosmopolitan Boho style. Actually, all you need is a wealth of shades of white, black, and brown, and you’re all set. In this example, the design style is brought about by the African-like pattern on the sides of the kitchen island, as well as the crocheted lampshades suspended above it. 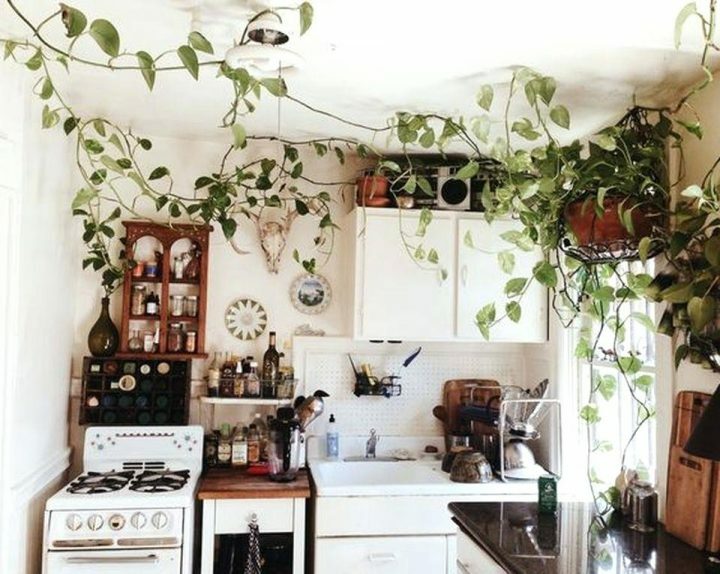 Plants, and in particular plants that are either foreign (like cacti for example), or that will gladly grow to take over your kitchen walls and ceilings, are a key ingredient for the Bohemian style. If you’re not particularly interested in spending a lot of time watering a whole plethora of plants, we’d suggest settling for an easy-to-care-for climbing plant that will -in time- twine its way all throughout the room. 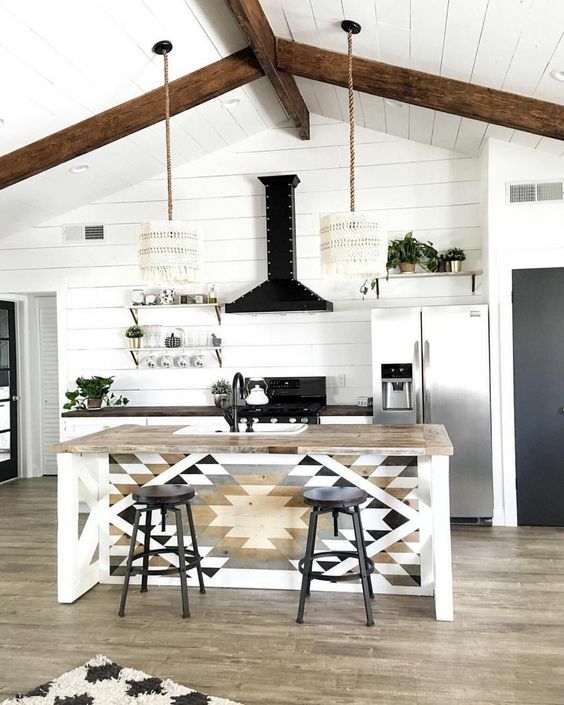 Just as the Bohemian style stands for the inclusion of a variety of styles and ethnic components, it also stands for an inclusion of the kitchen to the living space. If you have the chance, try to get rid of as many separations between kitchen and living room or dining area as possible. Or, have a go at it the other way round – incorporate at least a breakfast bar, but preferably as many “living room”-aspects to your kitchen as possible. Make it a home, rather than a work space! You’re lucky enough to have snatched up a really old property? You have exposed wooden beams on the ceiling, and maybe even an old-fashioned fireplace tucked into a kitchen corner? Flaunt it! With everything that you can lay your hands on! Embrace the old, embrace the rustic, embrace the sheer beauty of age! It’s the details that make up your Boho style. If you prefer neatness and uncluttered surfaces, the Bohemian will be hard to embrace. If you have been collecting interesting bottles, unique plates, and great tea sets all your life, and can’t imagine a better way of storing herbs and grains than in stacked jars, then you will do just fine! Dig out all that knick-knack that has accumulated over the years, and you’ll have the Boho look down pat in no time at all! Shabby is the new chic – that goes all the more for Bohemian design styles. In order to snag an authentic shabby look, garage and yard sales are your furniture stores, flea markets your household supply stores. Don’t shy away from peeling coats of paint and the occasional broken or missing handle. That’s exactly what you are looking for. Create homeliness by making use of furniture that has seen a lot of life, love, and friendship even before it found a way into your home. If there is one underlying theme to all of our chosen examples, then it is the idea of mixing and matching, of joining and incorporating. 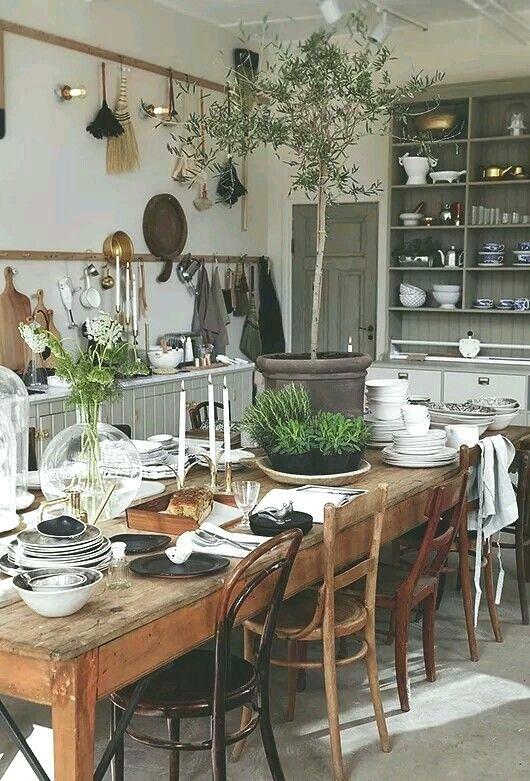 Just like this massive dinner table, that serves as the centrepiece of the Bohemian kitchen is a lesson in mix-and-match, we encourage you to just throw together whatever you have at hand and find out what sticks. Here, it is an eclectic mixture of mismatched chairs, stacks of different dinnerwares, and even potted plants set onto the desk’s surface that create a chaotic, inviting, and very homely atmosphere. It shouldn’t work (a potted tree! on a dinner table!! ), but somehow – it does! Which kind of Bohemian style matches your personality best? Colourful and bold? A mix of different styles? A huge dinner table in the kitchen? A whole lot of knick-knack and mementos making up the details? We’re curious to hear from you (and if you want to drop us a picture, we’re all for it! )!